1. Does the piece incorporate both curved and straight lines? 2. Is it relatively restrained, and free of applied decoration? 4. Does the design combine original forms with traditional infuences? 5. Is the piece substantial in appearance? 7. Are any metalwork fittings sympathetic to the piece, and perhaps of whiplash form? 8. Does any upholstery have beaded studwork? 9. Is the piece praclical? 10. If a chair, are any splats slender? 11. Are any feet chamfered, and curved slightly outwards? Henri Clemens van de Velde trained as a painter, architect and graphic designer in Antwerp and Paris, and was instrumental in the evolution of the Belgian Art Nouveau style. He designed all manner of items, including whole interiors, but was particularly influential in the fields of furniture, ceramics, jewelry and metalwork. His work was produced mainly to commission. Van de Velde's furniture tends to be substantial, with restrained, sculptural forms. In the manner of the Paris School, pieces rely on form for interest, rather than the applied decoration and inlay commonly used by adherents of the Nancy School. Practicaliry is never sacrificed for the sake of design the drawers of this unusual desk are all within casy reach. Rather, design works wich function the light fitting of this desk is incorporated into the piece. The electrical wire is trained through the metal gallery rail at the back of the desk. The railing is in a whiplash form, a common theme for his metalwork finings. 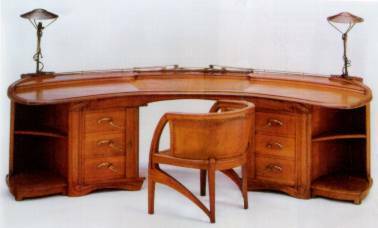 * The unusual desk chair echoes the fluid architectural forms of the French architect, Hector Guimard, rather than the work of Art Nouveau cabinet makers such as Louis Marjorelle (see page). * The leather upholstery of thr desk chair is characteristically decorated with beaded studwork. * The chair feet are simple. However, the feet on some other pieces of van de Velde furniture are chamfered, and may curve outwards slightly. Although porcelain designs by van de Velde are usually marked, his furniture rarely is. However, contemporary photographs of his work exist, which facilitates the search for the provenance of some pieces. Van de Velde used innovative elements in his work, such as the curvilinear construction of the desk in the main picture. However, his work avoids being bizarre by the tempering of the innovative features with strong traditional elements. The armchair above has a traditional feel, despite the innovative interplay of uprights and horizontals. The way in which the arm rests overlap the upright back rails is typical of van de Velde's work, as are the slender splats and generally spartan design and decoration. * The chair shows a Viennese influence in the union of form and function. 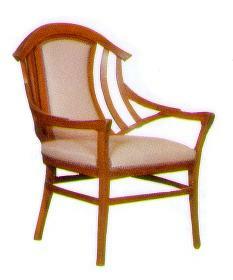 * Van de Velde also designed some chairs in cane; others were upholstered in leather or corduroy.